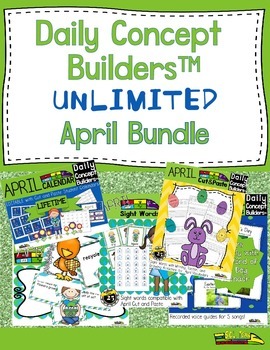 Word of the Day: This WORD OF THE DAY April Bundle includes all of our Word of the Day APRIL activities. Over 100 pages of awesome Word of the Day vocabulary games and activities to increase your students' awareness of seasonal vocabulary. Words have EASTER, APRIL FOOLS Day, APRIL WEATHER, EARTH DAY and TREE themes. There are 5 ELA books in this bundle that have real photos so the students can make great connections to the words of the day! All of these resources will work great as literacy centers! We have included a comprehensive guide for how all the resources cooperate with one another plus, when y'all purchase this bundle, you will get all the new items that we will continue to add to it! Thank y'all for all the support! We appreciate it!